Everybody likes to claim that their approach to health is “evidence-based.” But who has the right to make this claim? We can’t all be right, can we? Practitioners of and advocates for weight-inclusive approaches, including Health At Every Size® (HAES) models, claim that their approaches are “evidence-based”. Indeed, the evidence base is growing, as documented in the peer-reviewed literature perhaps most comprehensively by Tylka, Annunziato, Burgard, Danielsdottir, Shumna, Davis, & Calogero in 2014 (“The Weight-Inclusive versus Weight-Normative Approach to Health: Evaluating the Evidence for Prioritizing Well-Being over Weight Loss”) and by Bacon and Aphramor in 2011 (Weight Science: Evaluating the Evidence for a Paradigm Shift”). Advocates for weight loss and “obesity” prevention interventions, bariatric surgery, and other weight-based treatments and practices also claim their approaches as “evidence-based.” In a simpler world, one side would be 100% right and the other would be 100% wrong, but the world of evidence-based practice (EBP) doesn’t work that way. As an individual patient who has suffered harm from weight-based practices, and as an advocate who believes in her cause, I tend to want to focus on the evidence for HAES approaches and to disregard anything else. As a former trial attorney, I know that “truth” is as much about one’s perspective as anything else. As a health professional, my ethical obligations require me to follow the evidence wherever it takes me, even if I don’t like the results. In general, the available research “takes me” to weight-inclusive practices, but it is not always as clear-cut as the advocate inside me would like. One thing is clear – “evidence-based” is not simple. In fact, it’s a lot more complicated – messier, even – than it sounds. What do we mean when we claim to be “evidence-based”? Are we living up to what that concept means? Are the advocates of weight-based approaches? Is my health care provider? How can I know? Is it possible for both sides of the debate over weight science to legitimately claim to be evidence-based? 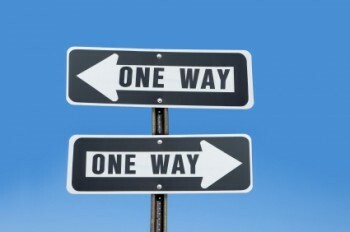 Or, when two points of view diverge so completely, can only one be said to live up to the idea of EBP? The concept has been broadened to include not just medicine but other health professions as well – thus the broader term, evidence-based practice. It’s common to see EBP represented graphically by a Venn diagram, showing the overlap of three key sources of information: external evidence; patient preferences and values; and clinical expertise. 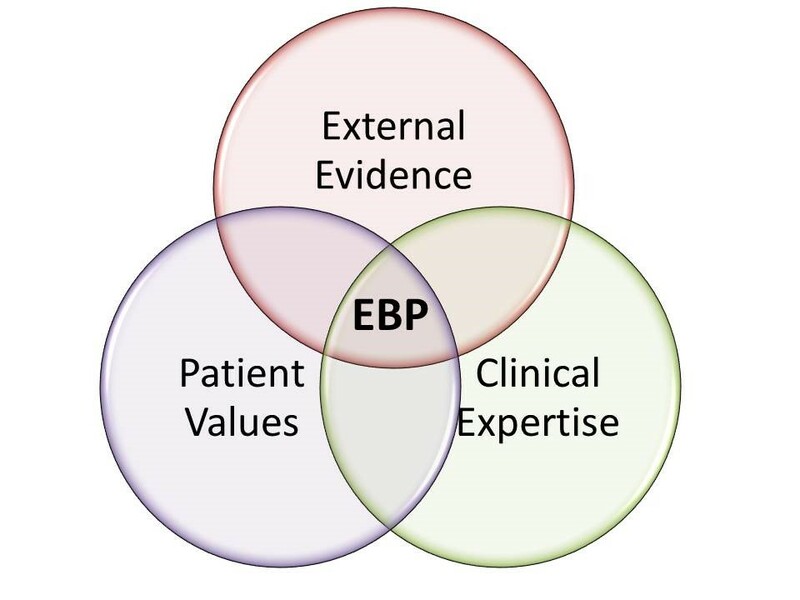 A Venn diagram depicting evidence-based practice (EBP) as the overlap of three sources of information: external evidence, patient values, and clinical expertise. Some experts suggest that there is even more to EBP than these three factors – clinicians should take into account the broader context. For example, The Survival Guide for Health Research Methods suggests that scientific evidence, patient values, and clinical wisdom need to be further “filtered” through both an assessment of what resources are available and the various professional, legal, and ethical frameworks applicable to the clinical interaction (pp. 8-9). We should filter the three factors of EBP through an assessment of available resources as well as professional and ethical frameworks. Note: this figure is based on Figure 1.1 of The Survival Guide for Health Research Methods. So, having defined some terms, now what? Should we – can we? – attempt to articulate a weight-inclusive EBP? As the HAES movement matures and gains momentum, it seems important for all of us – practitioners, advocates, clients, and patients alike – to understand what it means to say that a health practice is “evidence-based” and to be clear about our claims to that term for the HAES model. How can we get that clarity? By the way, I am not asking these questions randomly. As Chair of ASDAH’s Public Policy Committee, I am earnestly asking all of you – the HAES community – where you think we should go with this. What would be a useful result? Let’s say we come up with guidelines for EBP – is it one set of guidelines, or are there several, such as (for example) one for higher weight patients/clients, one for patients/clients with eating disorders, one for working with children, and others that I am not even thinking of yet? What about intersectional issues –should we create a separate set of guidelines on the nuances of working with various populations and how to honor multiple identities and cultures in a weight-inclusive approach, or do we build that into every set of guidelines (assuming we have more than one)? What else comes up for you when you think about the challenges of EBP? What do practitioners want and need? What do non-practitioners think? Would you bring a set of EBP guidelines to your health care practitioner if there was one? I hope this is the beginning of an ongoing conversation, and I look forward to the dialogue. Fall Ferguson, JD, MA is the Program Chair of the Health Education Program at John F. Kennedy University in Pleasant Hill, California. 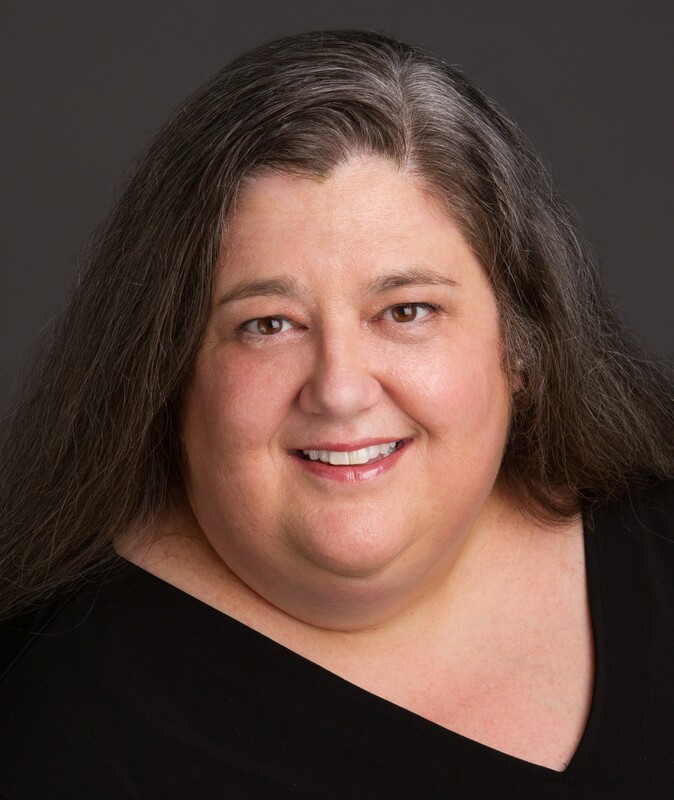 She teaches courses on health policy, community health, health coaching, educational methods, and body acceptance, among other subjects. Fall served as the President of ASDAH from 2012 through 2015, and currently chairs ASDAH’s Public Policy Committee. Many interesting points made here. It’s so important to truly consider the motivations of people when they are using the term ‘evidence-based’, and really look into what they are calling evidence. Thanks, Jordan. I agree that the label of “evidence-based” cannot be taken at face-value. I think much of what is claimed as EBP these days is anything but evidence based. I am interested in your comment regarding “motivation” – what do you think is the role of motivation here? I contend that every clinical trial that includes subjects with a BMI over 25 that does not use weight loss as its primary endpoint is evidence for a weight-independent therapeutic approach. The scores of double blind trials of statin drugs for the prevention of heart attacks is one example. Most of the subjects in those trials were “overweight” and many were obese. There was no weight loss, and subjects continued to gain weight as they aged. These obese subjects lived longer and had fewer heart attacks if they took their statins, compared to equally obese subjects given placebo. This is just one of many examples of life saving medical treatment for obese people that does not involve weight loss. There is a vast amount of support for non-weight-loss interventions improving the health of obese people, especially pills for lowering blood pressure and cholesterol. Some of these interventions, such as insulin and pills for diabetes, may actually cause weight gain in obese people. There is vastly more evidence to support the benefits of weight-neutral interventions such as medications than there is to support diets and surgery for weight loss. Great point, Paul Ernsberger PhD! What a great example of how paradigm paralysis can blind us to the import of the evidence we already have in front of us. Thank you for this. As an Employee Benefits Professional I am aiming to change the persepctive and application amongst employers/brokers/insurance communities of what ‘wellness’ is. The research that’s quoted to sell well being programs is at best questionable – but there’s no questioning going on. I was shocked to find that a recent consulting client had a three year plan in play, to penalize (premium wise) folks who didn’t meet weight loss goals. I provided some strong data contradicting the use of BMI as a measure of ANYTHING that would drive ‘surcharges’ – and have aimed to give them additional thoughts on their program. Once the momentum for such programs is invested in/sold to employers, it’s not easy to put on the brakes. This is most appreciated, Fall. Thanks for the comment, fmelias. I appreciate the reminder that insurance companies and employers are among the most important “consumers” of the claim of EBP – “evidence based” has become the standard for whether or not a practice or procedure will be covered/compensated. It’s going to be terribly important to articulate in a clear and straightforward way – with an authoritative voice – what those inaccuracies are. Thank you for this thoughtful article. I think it’s important to integrate cultural sensitivity and humility with EBP. Much of the literature is hobbled due to studies only including a narrow range of cultural group memberships. I tend to agree with you, delirium rose. I think we are going to have integrate this intersectional awareness into every set of EBP standards we come up with, otherwise, we propagate the errors of non-inclusion. There is another meta-issue here as well, which is that all the focus on the health consequences of higher BMIs takes attention and resources away from understanding and remediating the health consequences of social determinants that we know actually do affect health. Since many practitioners are not solo practitioners, but are employees (or independent contractors of…) large HMOs or PPO networks, etc., etc., they pretty much have to follow the “guidelines” given to them by the entity writing their paycheck if they want to remain employed. You’re absolutely right, rg. Too many obese patients are not aware of these guidelines and think that their physician is singling them out for bad treatment. Sadly, patients have to learn to tune out the messages that are scripted out for physicians by higher-ups and move on to what the physician actually thinks. If only the answer to blunting the impact was tuning out the message! But the structural nature of these guidelines means that people are having their medical care held hostage to demands to lose weight or get surgery (bariatric, rather than the kind you really need), or to a lack of equipment for their bodies, or to a lack of trust in the medical relationship because really, how can you trust when people are hamstrung by these structures? There really isn’t a workaround. bodypositive, you make a great point that we still need to change the structure – it’s not OK to just ask the victim to pay no attention to the person inflicting the harm. The structures must change, AND… I think there is a also useful form of patient education here to understand the harm of the systems and structures, and not take the stigmatizing communications at face value – ? Guidelines require that the physician lecture you about your weight on each and every visit. Guidelines do not demand that they withhold medical treatment. If they doi that, then that is the fault of the care provider, not the guideline writer. Deb, those Endocrine Society guidelines are truly awful We can only hope they are not adopted by health care organizations, which is where they really control physician behavior. I just saw another Medscape article reporting that 85% of endocrinologists are prescribing weight loss medications, far more than any other specialty. It seems that the practice of endocrinology has been taken over by bariatric physicians, which is really a shame. Good points, rg and Paul Ernsberger PhD… This suggests that patient education around EBP is important in addition to practitioner education. The issue of learning to tune out messages from your health care practitioner because they’re not actually his or her messages but rather he or she is acting as a mouthpiece for some bureaucratic entity with which the patient can never interact directly is, in my opinion, right at the very heart of why fat patients get worse health care than non-fat patients. By inserting the need to always make the patient wonder, “Wait, stop. Is my practitioner currently speaking in his/her own voice, or is s/he acting as a ventriloquist’s puppet for some other entity?” that is the very maneuver that causes the rupture in the doctor-patient relationship. It is basically saying that it is not possible for a fat person to have a normal doctor-patient relationship, no matter who the doctor is and who the patient is. It is the fact that the patient is fat that makes this impossible, not anything else about the doctor’s knowledge or training or about the patient’s honesty or trust issues. And of course deep down most fat people already know this, which is probably why so many of them/us elect not to enter into doctor-patient relationships at all — because those relationships will necessarily be strained phony uncomfortable and abusive relationships right from the get-go. This violates, at the organizational/institutional level, the “First, do no harm,” principle. Wow, this is a wonderful post! This is a very complicated subject, and I appreciate your explanations and honesty. Thank you! I am very new to the HAES principles, but so eager to learn and embrace them. As an obese woman holding a master’s degree in public health, I have never felt more out of place than I do in the public health community. I’ve dieted for as long as I can remember (even going so far as to have gastric bypass) and alas I am (and probably always will be) fat – I’m trying to learn how to live my best life rather than the constant diet roller coaster. I’m writing this comment to ask for some advice please. I don’t know where to ask my question so I thought I’d start here. Yesterday I took my 16 year old daughter for her annual check up. She’s gained 40lbs over the past year and the doctor said she isn’t concerned with that alone, but her concern was that my daughter’s blood pressure (taken at the beginning and twice at the end of the visit) was 139/87. She is also testing her thyroid. My concern first and foremost is my daughter’s health. I am trying so hard not to link her high blood pressure with her weight gain. The world has programmed me well and my natural inclination is to want to work on our diet and exercise – to lose the weight and therefore lower the blood pressure. I don’t want to go down that road with her. I love her so much and want her to love herself and her body just the way it is. If any of you knowledgeable in HAES can offer up some wisdom on how to think and act upon this situation I’d be so appreciative. I want to do what’s best for my daughter, not what’s best for the number on the scale. Thanks so much for reading. i apologize that I was so long winded. Big kids reach adult levels of blood pressure –120/80 –sooner than smaller kids. But your daughter’s levels would be borderline high for an adult. Many hormones change in adolescence. Adrenal hormones can run high periodically –driving weight and blood pressure at the same time –and stress compounds the issue. Many teens crave salty foods and that can create blood pressure problems.